A misleading video and allegations of photoshop. 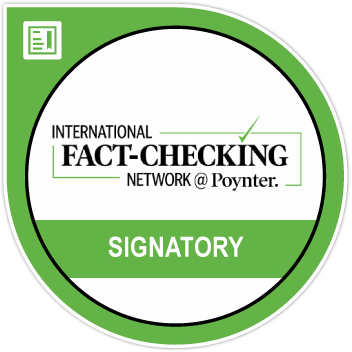 BOOM does a fact-check. 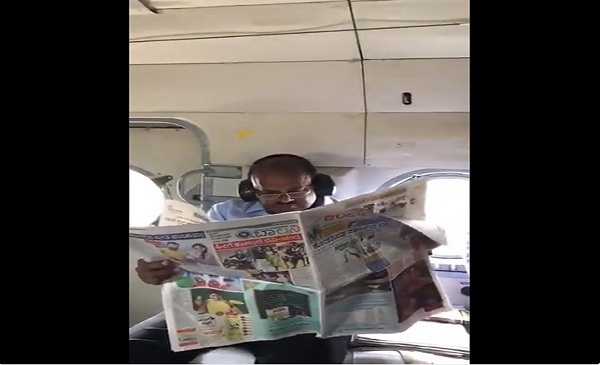 A video showing Karnataka Chief Minister HD Kumaraswamy reading a newspaper in a helicopter while undertaking an aerial survey of the flood affected Kodagu region of the state, has gone viral. While the CM is being criticised for reading a newspaper instead of surveying flooded parts of the district BOOM was able to verify that the video was in fact shot during takeoff while the chopper was en-route Kodagu. The 50 second video shows Kumaraswamy who has his back to the window reading a Kannada newspaper. It also shows two defence personnel sitting on Kumaraswamy’s right with one of them being told to take a seat by another personnel. At the time of writing this story, Srinivas’ tweet was retweeted nearly 5,600 times with BJP leader and Member of Parliament Shobha Karandlaje also sharing it. This is the seriousness our CM @hd_kumaraswamy is having in aerial survey facility which is provided to him..Even though our officers are busy doing the survey ,CM is shamelessly reading a newspaper. 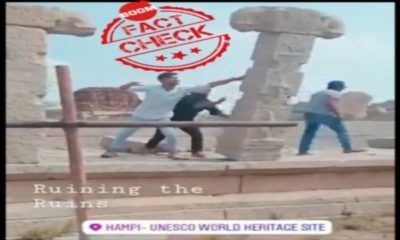 BOOM reached out to the chief minister’s office who said that the video was in fact shot when they were on their way to Kodagu on the second day of the CM’s visit to the region. National Spokesperson of the Janata Dal Secular (JDS) Tanveer Ahmed told BOOM that the chopper had just taken off and the CM was reading the paper as he does every morning. 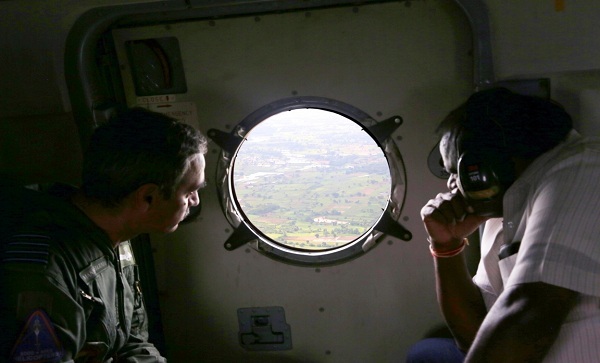 “During any chopper visit, there is always a defence personnel who explains to the CM where they have reached, which areas have been evacuated and what is the state of the rescue operation. At every point, the officer updates the CM about the location of the helicopter so that he knows which area we are flying over and what is the condition of that area,” explained Ahmed. The official Twitter handle of the Chief Minister’s Office also tweeted a 50 second clip on August 19 showing the chief minister surveying the area while on board the aircraft. The video was posted three hours before Balaji Srinivas’s tweet. 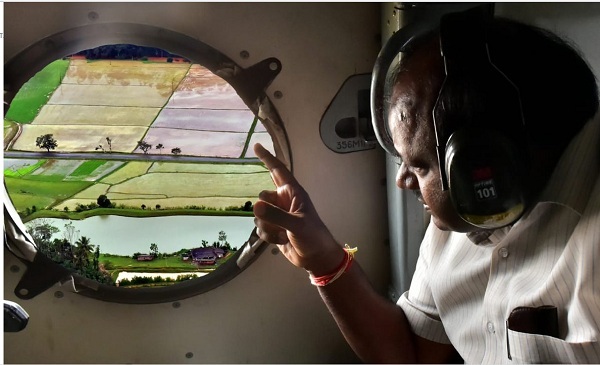 Twitterati questioned the authenticity of one of the photos from the CM’s aerial survey wherein he can be seen peering out the window of the chopper at flooded fields, with his arms crossed. The photo shows the exterior landscape in sharp focus. President of India Ramnath Kovind today called CM HD Kumaraswamy& inquired about the situation in Kodagu. Photos tweeted by newspaper Bangalore Mirror on August 18 of another aerial survey of Kodagu by the CM also seem to indicate the images were edited or enhanced. #KarnatakaFloods; CM @hd_kumaraswamy reviews situation in the State. In the photos above the colour tones and saturation of the landscape do not appear normal. Photos taken in high contrast light (bright outdoors and dark interiors) normally show the outdoor scene as overexposed or indoors as underexposed. Images sent by the Defence PRO to journalist show the difference in the photos. 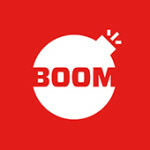 BOOM reached out to the CMO and the Department of Information and Public Relations (DIPR) which has a team of photographers who accompany the CM on official visits. We also reached out to the photographer who accompanied the CM to Kodagu. He denied the pictures were photoshopped. While the DIPR emailed us photos from the visit they did not send the original files making it difficult access the EXIF data. EXIF data is the embedded information about any photograph clicked by digital device including mobile phone. The metadata contains details of date, location, device used to click the photo.